Have your friends and family over for the big game and sit back and enjoy it on this sleeper sofa. 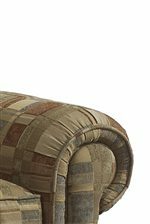 This sofa has rolled arms and curved edges. 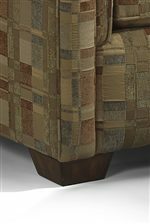 The four block legs raise this couch off the ground and give it a traditional style. Cushioned seat backs and seats will allow you to relax and enjoy the company. Place an end table in front of this sofa and serve your guests delicious appetizers. They will be impressed with your fabulous hospitality and fashionable furniture. Pull the cushions out at night for the perfect spot for overnight guests to catch a relaxing night's sleep. Available in Twin, Full, and Queen Sleeper Sizes. Cushion comfort and mattress upgrades available with additional charge. The Main Street Rolled Arm Twin Sofa Sleeper by Flexsteel at Conlin's Furniture in the Montana, North Dakota, South Dakota, Minnesota, and Wyoming area. Product availability may vary. Contact us for the most current availability on this product.